To say the presentation here won�t do would be to pay Archipel a compliment, because there isn�t any. You get the titles of the works and the individual movements, with the track numbers, the names of the performers, the venue, the date, a photo of Joseph Keilberth (taken quite a few years later than these performances, I would suggest), plus the information that the recordings are "previously unpublished" and "issued from original sources". And that�s all. And yet, considering that Joseph Keilberth (1908-1968) is hardly a cult figure � he tends to be regarded as the archetypal Kapellmeister � you would think it in Archipel�s interests, since they presumably want to sell the disc, to try and make a cult of him with some hyperbolic presentation, suggesting that it is time for a reassessment (which it quite probably is). Well, at least you can look Keilberth up, but neither of the two Italian musical dictionaries in my house mention Danilo Belardinelli. An Internet search reveals that a conductor of that name was active in the 1960s and 1970s so I suppose this must be the same person. And as for the "issued from original sources" bit, in the wake of the recent Capitol v. Naxos judgement, I suggest that any hawk-eyed New York State cop grubbing around Fifth Avenue basement stores in search of compromising material is going want to know to what the original sources were, who made them and who owns them. There can be little doubt about who made them. If our NY sleuth is at all musically inclined he will quickly note that this is not a ladies� handbag recording, it�s been made from proper microphones, though rather too close for atmospheric results (and ridiculously close to the violinist in the concerto), and he will hear from the swish � fairly well tamed and noticeable mostly in pauses and very quiet passages � that it has been preserved on acetates. The sound has that slightly harsh, glassy and top-heavy sound characteristic of late acetates compared with the softer sound of early tapes, and there is none of the warping or print-through which would demonstrate a tape origin. For most of its post war history the RAI (Italian Radio) has been in the habit of broadcasting the Sunday afternoon concerts of the Santa Cecilia Orchestra, and in 1952 it was still recording on large acetates, or else on tape but transferring the results to large acetates and not necessarily keeping the tapes (as happened with the Furtwängler Tchaikovsky 5th). Just to settle any remaining doubts, over the last decade the RAI has been restoring its historical material, transferring it to digital support and broadcasting the results. Our hardworking detective can now plug into the Internet and discover that the RAI�s series Archivio storico della RAI re-broadcast this pair of performances on 3rd February 2003. Now, far be it from me to insinuate that someone at Archipel taped that broadcast (and since broadcast performances come out of copyright in Italy after a mere 20 years maybe it would be perfectly legal to do so, though I should have thought that your own taping would have to have been made at least 20 years ago before you could issue it); it is perfectly possible that duplicates of the original material were made at the time of the concert for the artists or for the Santa Cecilia archives and Archipel have worked from those. But I do feel that historical issues like this should be properly documented. Mind you, however above board this record is, I suppose that Belardinelli (if still alive) or his heirs, plus the heirs of Joseph Keilberth and probably the RAI too could now claim royalties on any sales in the State of New York, but that�s another story. Well, having got that off my chest, what are the performances like? 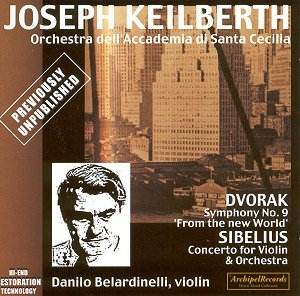 I have already praised Keilberth�s recording of the Dvoř�k cello concerto with Hoelscher and noted on that occasion that he was maybe the only German conductor of his day to perform Rusalka. He certainly doesn�t sound like a Kapellmeister, he conducts with plenty of upfront vitality in the outer movements, alternating with a lighter lilting touch for the lyrical moments. Second subject material relaxes more than is customary today, but rather less than was usual then. The slow movement is very slow, but the melodies are phrased with great expressive freedom and genuine depth of feeling. The closing pages of this movement often seem to drag on a bit too long; here I was quite entranced by the heartfelt response Keilberth extracts from the orchestra. There is an unusually wide contrast between the tempi in the scherzo; authorized or not, Keilberth thus obtains an irresistibly seductive sousedská-like lilt in the trio. This is a performance I shall come back to, but how important it is in the pantheon of recorded New Worlds depends on a question to which I don�t know the answer: does Keilberth�s Telfunken recording of the work with the Bamberg Symphony Orchestra (unavailable on CD as far as I know) have all the virtues of the present one in better sound, or did studio conditions and a German orchestra bring out the Kapellmeister in Keilberth? In the latter case, the present recording has a place, though the ragged and sour opening might not lead you to suppose so � don�t let that put you off. As for the Sibelius, Belardinelli has the right feeling, but some of the most taxing passages result in flawed intonation; this, and the tiresomely close recording, would only be worth ignoring for the sake of some special insights into this much recorded work, and I can�t say any are on offer. Romans unfamiliar with the piece in 1952 (Sibelius has little or no appeal for the Italian public who even today dismiss him as a minor exponent of the nationalist schools) got a good idea of it but the performance need not detain us today. For his part, Keilberth is punctual and provides some thrilling moments when on his own, mainly in the first movement. This disc certainly demonstrates that the art of Keilberth would be worth further investigation; the trouble is that it also gives the idea that such investigation, properly carried out in the archives of European (and other?) radio stations, might yield far better results than here.